Since 2010, a consistently increasing number of Ohioans have reported having Lyme disease, which is spread by the blacklegged deer tick. COLUMBUS – A steadily rising number of Lyme disease cases are being reported in Ohio. The disease is transmitted by a tick that can be as small as a poppy seed. Every year since 2010, when Ohio’s first population of blacklegged deer ticks was discovered in Coshocton County, the number of people infected with Lyme disease has increased. Last year’s statewide total of 160 human cases of the disease is more than three-and-a-half times the 2010 total. Besides the increase in Lyme disease, more Ohioans are reporting cases of other tick- related diseases, leading to concern about tick populations that used to be rare in the state. 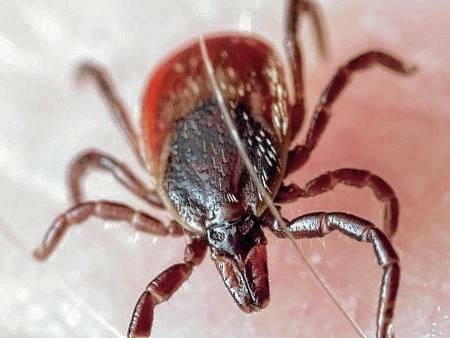 While reported cases of Ohio residents infected with Rocky Mountain spotted fever have risen in recent years, the annual totals are significantly smaller than the number of Lyme disease cases. In 2016, a total of 24 Ohioans reported they had Rocky Mountain spotted fever.